Vampire hunting kits, allegedly from the nineteenth century, have done the rounds in auctions, fetching high prices. But there's questions surrounding their authenticity. Are they legit? No discussion of vampire products would be complete without mentioning the several anti-vampire kits. The first such kit was alleged to have been produced by Nicolas Plomdeur, a gunmaker in Leige, Belgium, in the mid-nineteenth century. His kit included a real pistol made in the shape of a latin cross, a silver bullet, a wooden spike, powder flask, and a clove of garlic. The only known surviving example of the Plomdeur kit is owned by Val Forgett of the Navy Arms Co. A similar kit can be found in the Mercer Museum at Doylestown, Pennsylvania. 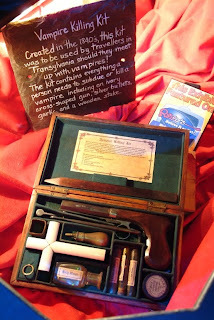 This kit's wooden box contains a pistol, two silver bullets, a cross attached to a wooden stake, a magnifying glass, some garlic, and several "serums" especially formulated by the kit's manufacturer, reputedly a Dr. Ernst Blomberg. The kit was reportedly designed for nineteenth-century English-speaking travelers going to Eastern Europe (458). You may, or may not, have the same gut reaction I did: "Hey, wait a minute." That's what a modern vampire hunter might pack (with the silver bullets in case you run into a werewolf), but it's not what a 19th-century vampire hunter would carry. Dracula met his death by bowie knife, Carmilla was hacked up with an axe (I think), Varney threw himself into Mount Vesuvius, and Lord Ruthven got clean away when Polidori got writer's block. If you go back to the lore (Montague Summers's fascinating THE VAMPIRE IN EUROPE is a wonderful source), you'll see that the way we think of vampires, and killing them, is most strongly based on 1) Stoker's novel and 2) the movies it inspired. My story starts in or around 1970 when I was employed in the printing industry. My hobby was buying, selling and refurbishing antique guns. I sold mainly at the famous Portobello Market in London. My usual stock of guns for sale was only 10-20 at any one time and these tended to be of superior quality. I had a number of regular clients who arrived every week to see if I had any new stock. One of my regulars wanted a fine flintlock pistol and asked me to take in part exchange a Belgian percussion pocket pistol. I grudgingly agreed and allowed him £15.00 off the price of the flintlock. So, here it is, a poor quality pocket pistol in mediocre condition! What to do with it? That was my question. Having an extremely fertile imagination and being an avid reader, I was inspired. It occurred to me that I could produce something unique that would be a great advertising gimmick and would attract people to my stall. The Vampire Killing Kit was on its way. Regarding Professor Ernst Blomberg and the Gunmaker of Liege, Nicholas Plomdeur, both these gentlemen were figments of my imagination and I was amazed to find mention on a Website of Nicholas Plomdeur’s early career in Paris. Nonetheless, some express doubt with de Winter's confession. A thorough investigation of the claims about various Blomberg (and Plomdeur) kits can be read at Spooky Land. However, general consensus holds that the kits are fake, even if some possibly preclude de Winter. There are too many anachronistic and urban legend-like elements in the stories behind the kits. Cited documents associated with their makers can not be traced, while others are revealed as outright frauds. If that doesn't attest to the fakeness of these things, I dunno what will. You will be amused to note that a recent edition of US reality show “Auction Kings” recently featured a vampire hunter’s killing kit. It is my understanding that the young man who is the owner of the auction took it to his father – an antiques dealer – to authenticate it. The reason, if it were a fake it would ruin their reputation! Ah, the thriving (fake) vampire killing kit still thrives! Cheers for bringing this to my attention. I'm guessing his father was basing his assessment on other kits he'd come across or heard about - without bothering to research their historicity, of which there's no evidence. The problem with these kits, is that they incorporate actual antique items (like pistols) and just cobble 'em together with other stuff to give an air of authenticity. But if these guys would only do their research, they'd find that there's no extant, contemporary references to these bloody kits in the first place. Gah! It's just like the medieval trade in faked relics. I feel sorry for the suckers who pay top dollar for 'em. I could blame their gullibility, but the problem is, the auctioning houses are promoting them as authentic. How many people really question the authenticity of an item, when the auction house declares it the real deal? Honestly, though, this racket needs to be exposed. Indeed, my cover is blown. I find that I must promote it. The longer it sits around here, the greater my desire to keep it for myself. Thanks for your honesty, Tracy. However, I think you should've been more forthcoming about the authenticity of your kit, especially when you include a fake book with it, claiming it was published in 1851. I don't mind woodworkers and such creating pseudo-antiques, as long as they're forthcoming about the actual origins of their respective kits. As I've exposed here, there's a trade that thrives on deception concerning these kits, ripping thousands of dollars off buyers. I wouldn't think you'd want to be one of 'em. How could I be any less forthcoming by saying that it is an antique reproduction? At the bottom of my website (and on the back of that "book" it says very clearly "All items handmade, collected and written by Tracy L. Conway" The only way to be as brutally honest as you seem to require, would be do perform an itemization of each piece declaring its authenticity or not. There is a story to everything and I am more than willing to verify any piece of the kit, I don't feel it's in the best interest of 'the story' to disrupt it with facts and figures any more than I have already done. A book written in 1851 would have been a leather journal, most likely. Despite all that, being a classically trained woodworker, the time I spent building the case and the items within the kit justifies the cost. Most 'modern' vampire kits come from hobby lobby these days. Let's recap. You posted a link on my blog advertising the kit. When I pointed out that it was actually a link to your kit, you said your 'cover' was 'blown'. One could easily interpret such actions (without previous disclosure) as spam, or, at the very least, advertorial practices. True, your website does mention they're handmade and written by you, but the content of the site, itself, implies that they're genuine, especially with the book written in '1851'. Indeed, the author's name ('Thornton Barrett Conway') is a riff on your own, but some could think that the author's surname might be a coincidence, or perhaps an ancestor's. This, of course, would hinge on their ignorance of the appearance of such artefacts. If you've read my blog, you'd see that 'brutal honesty' is something I strive for, and in terms of vampire killing kits, that's especially applicable when we're dealing with a trade that plies faked antiques, with no such disclosure. As far as I'm concerned, a 'story' should never get in the way of the truth, especially as 'stories' tend to be reproduced as factual (see my writings on the FVZA) and appear in other sources to this effect. Concerning the book, itself, I've even written an entry on fake books and The Vampyre Hunter's Guide one would be an addition to that catalogue. Keep in mind, I have spotted instances of such fake books appearing in factual works, too. For instance, a fake entry - 'Erah, J. Onurb. Key to Witchcrafte & Demonolatrie for Guidance of ye Slayers' - has appeared in reproductions of Summers' work. Their origin is from the Sacred Texts website and is actually the site's owner. One of the recurring themes in my blog, is debunking 'stories', as they hinder the positive aims of research. You're right in saying that most 'modern' kits are made by 'hobby lobbies', however, the point of my articles on such kits, is that all of them are of modern origin and, indeed, sell for exorbitant prices. To me, that is a deceptive practice. As I've noted, I have no issue with kit makers who disclose the modern origins of their kits, but the tide of fake antiques with no proper attribution, should be halted. Which guy has the best hair??? - submitted by /u/aft33 [link] [comments] The post Which guy has the best hair??? appeared first on Vampire News. Where's the Salem's Lot Sequel? Special LIVE interview of the Vampirologist - vampirologist, Theresa Bane on FATE Radio, WGOGDB Digital Broadcasting. Blog news for "main" cave.